Autumn is in full swing, and I am craving nothing but pies in all shapes and sizes. 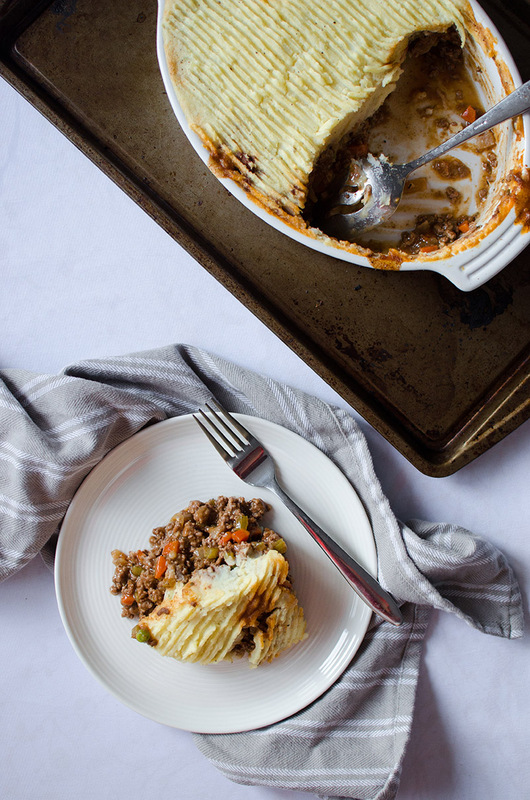 Last week’s obsession was a rich and hearty shepherd’s pie. 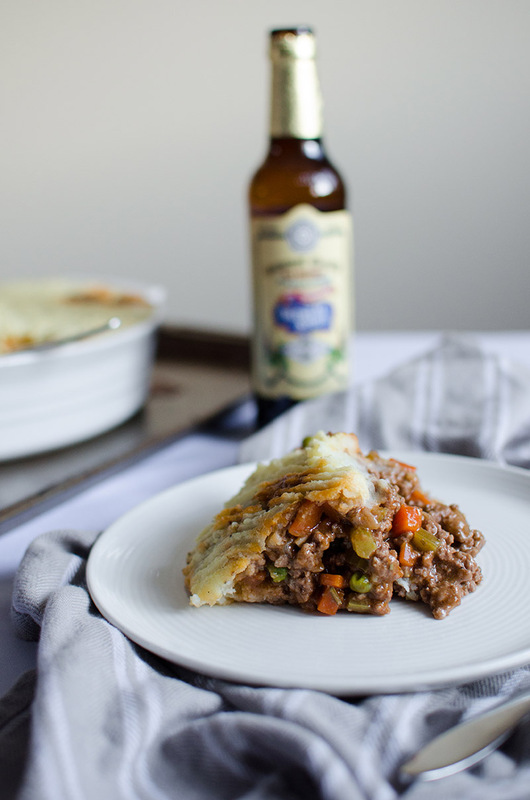 The Irish pub that everyone at UC Davis loves, de Vere’s, serves the best shepherd’s pie. The meat filling is smothered in a dark, rich gravy that is absolutely divine. A fluffy, light blanket of mashed potatoes covers the filling, and the whole shebang is baked in the oven until the potatoes are light brown and toasty. I have been trying to replicate this dish for the past two years and every time I make it, I get a little closer. I just couldn’t figure out what made de Vere’s gravy so rich. Finally, last weekend, I solved the mystery to the incredibly delicious gravy. 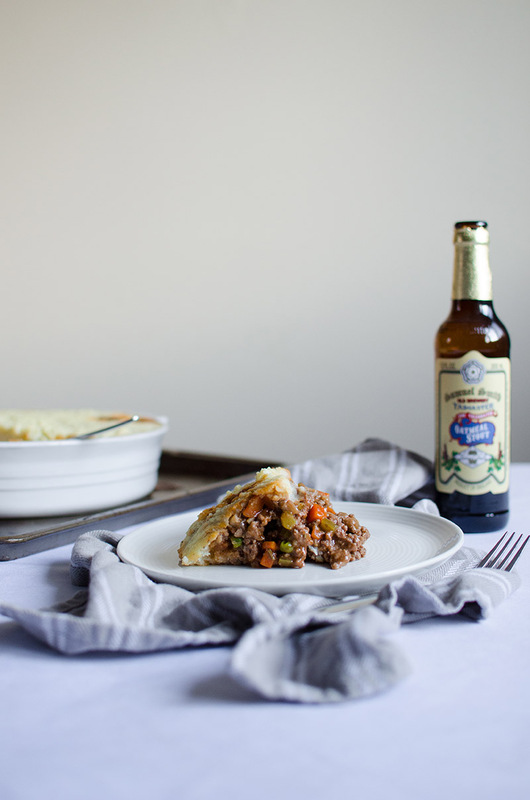 The answer was beer – beer made the gravy decadent and added the extra depth of flavor I had been searching for! 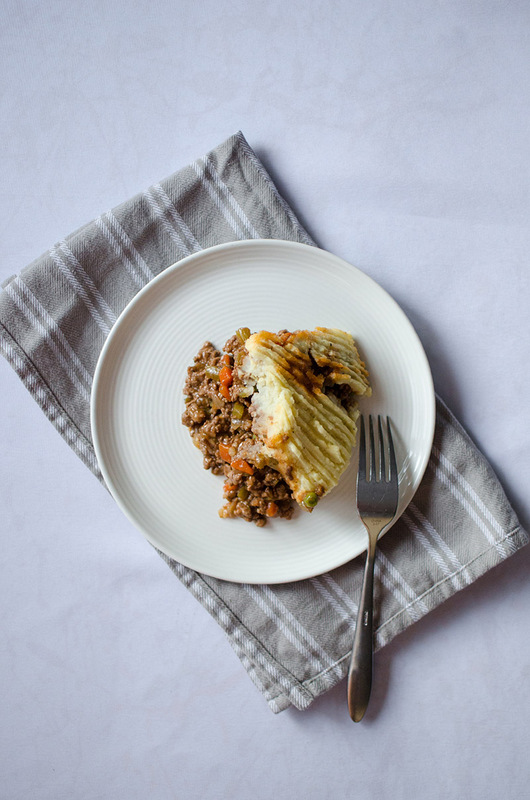 I was so excited the recipe was ready for the blog – I’ve made it twice in the last week. I hope you all enjoy this not-so-photogenic beauty! Finally, happy apple picking season! Karl and I went last weekend (pictures posted here) and have been enjoying the fruits of labor in the form of apple crisp (recipe in the archives). In a large saute pan, heat up the oil over medium-high heat. Cook the onions, carrots, and celery until soft, stirring often, about 6-8 minutes. Add the garlic and stir for another minute. Add the ground beef, 1 teaspoon salt, ½ teaspoon ground black pepper, worcestershire sauce, and tomato paste to the pan and use a spoon or spatula to break the meat up into small pieces. Stir and cook until brown, about 4 minutes. Add the flour and stir to coat the meat. Pour in the beef broth and beer. Bring to a boil, then reduce the heat to a simmer and allow the sauce to thicken for about 10 minutes. Stir in the peas, then set aside. Fill a 5-quart pot halfway with water. Bring to a boil, then add the potatoes. Boil for 13-15 minutes, uncovered, until the potatoes are soft. Drain the potatoes in colander, then place in a large mixing bowl. Add all of the ingredients to the mixing bowl, and mix with an electric mixer on medium speed until smooth. Set aside. Pour the meat filling in a medium-size baking dish (about 4 quarts or 11 by 7-inch). Spread the mashed potatoes evenly over the top, or use a piping bag and pie the mashed potatoes over the top. Place the dish on a baking sheet, then bake in the preheated oven for 25 minutes. Cool for 15 minutes, then serve. This entry was posted in Entrees and tagged beer, carrots, celery, gravy, ground beef, mashed potatoes, onions, peas, stout. I missed this recipe from last week. I’ll give it a try as Paul always loves the meat n potatoes entrees. I love the savory in any shape or form!